We have litters and puppies available at various times during the year. If you are interested in one of our puppies please fill out the application. You will receive an automated message so that you know the application went through without a problem. We review applications on a regular basis, when you are approved you will get an email to notify you and you will be added to our mailing list. At that time you can send in your deposit. We have prepared a deposit information document for your convenience but please feel free to call and ask questions at any time. If the online form is not working for you, you can use the PDF version or just type the answers in an email or word document. Please copy the questions so that I know what you are answering. Please take some time to read through the information provided on the Newfoundland Club of America website. 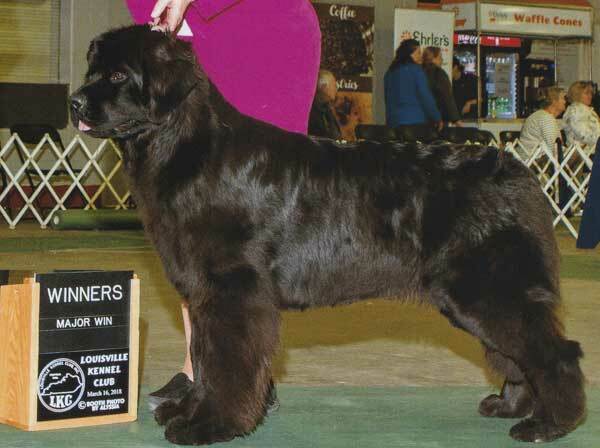 Thank you for considering Belle Harbour Newfoundlands! GCH CH Honey Lane's Touch of Gold at Terraline DD, WD, WRD, CGC, BN, AM-Top14 2014 - "Midas"
CH CH Belle Harbours Lily on Seas of Dark - "Lily"
CH Belle Harbours Razors Edge- "Nick"
Belle Harbours Just Your Foolish Price - "Layla"
GCH Honeylanes Smoke on the Water- "Marshall"
CH Belle Harbours Walking on Water - "Jenny"
Check our planned breedings on the litters page for future puppies. Maddie x Maverick puppies are here. 1 male and 1 female avail to approved homes.